Came across some resin stuff in my stash and thought why not build them in parallel. Introductions in more detail to come - looking forward to get started. After deciding that the Kora Beneš-Mráz Be-250 Beta Major kit isn't much fun to build, I replaced it with the above two plastic kits. Nice to see some exotic types in an exotic material winging their way GB-wards. Welcome to the GB Peter, I hope you'll enjoy yourself. I'm certainly looking forward to seeing what we all end up doing. Indeed, but they are creations of their time. Thanks zegeye. They are all small kits with not too many parts. SBS Models do look great in the box and I hope they build as well as they look. I got out of the starting blocks and had a go at the SBS Model Skandinavisk Aero Industri SAI KZ II Træner. The SAI KZ II flew first in December 1937 and until 1940, 14 "Kupe" and 16 "Sport" variants had been built. After WWII, the RDAF needed a trainer and SAI developed the "Træner" version, which was basically a strengthened "Sport". 15 "Træner" had been produced by SAI and the first flight of the type was in April 1946. The "Træner" was in RDAF use until 1955 when the remaining aircraft got sold for civil use. Several aircraft still exist to day and some of them are airworthy. But surprisingly detail pictures of the type are scare and I couldn't find any pictures of the cockpit, only one from the IP. But I came across this documentation (PDF) on SAI aircraft which contains many historical pictures. The contents looks like a nice complete package. And the resin parts are exquisite! I will build 119 from the time with the Royal Danish Air Force belonging to Flyveskolen at Avnø in the late 1940s. 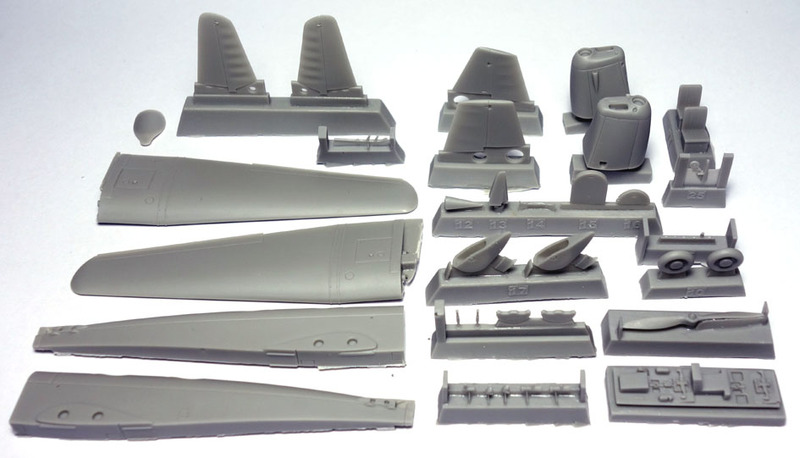 As with any resin kits, most parts need preparation by removing them from the casting blocks. After that, assembly can commence, and with most aircraft, the cockpit is the first step. The cross tubing provided by SBS is a bit over scaled. They also break off easily and after doing that several times, I replaced them with brass tubing. 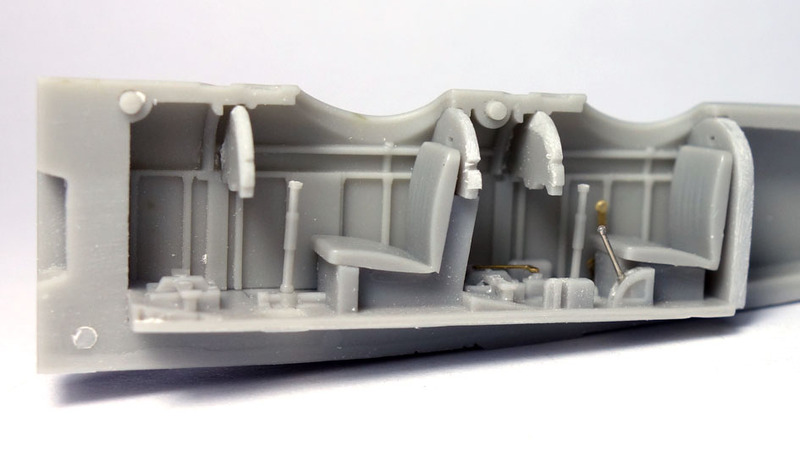 Here the first replacement in place together with some other resin parts in the cockpit. Soon I noticed some rather strange omissions in the cockpit. There are no rudder pedals in the cockpit and the seat harness only contains the upper part. Also don't fit the front control stick (item 26) as shown in the instructions with a forward slope as it will interfere with the IP! Not sure what I do about the seat harness. I may replace it with one from Eduard. I made some rudder pedals from an Eduard rear mirror PE set (insert below). They have to be the shiniest rudder pedals The throttle PE and the cockpit openings are also in place. And here with the floor and seats in place. Considering the small size, the cockpit does look nicely detailed. The most challenging part is to glue the seats in a way so that they are placed correctly as there is no provision to "lock them in place". I had to remove and re-glue the rear seat to make it sit properly. 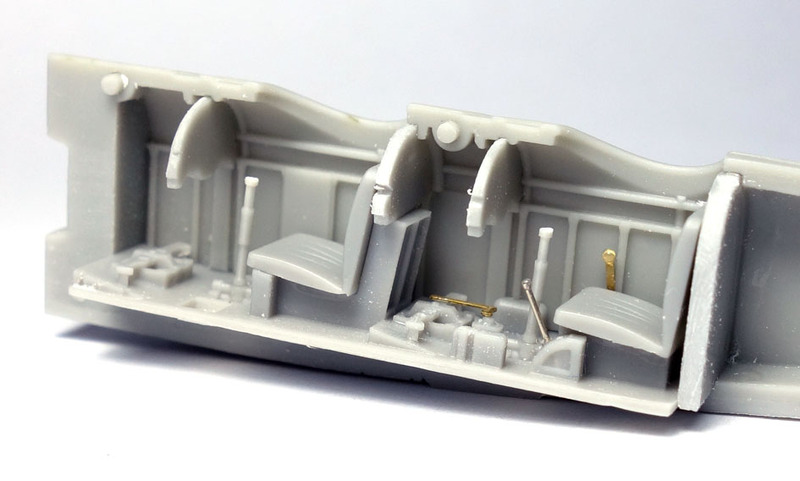 The cockpit is now ready for painting, but I will build the other three cockpits first so that I can paint them all together and the Caudron Aiglon is next. More than four dont forget the Fairchild PT series in the U.S.
Of course the four types I am building are not the only "look alike". As you say, there is the PT-19. Then there is the German Klemm 35 and British Miles M.14 and I am sure there are more. But what is interesting is that all the four aircraft I am building got developed for private flying and not for military use! And my favourite Tokyo Koku Ki-107. Great start. Very precise building here. Like many reading this thread, I had no idea of the variety of the era of Trainers. I never heard about the Tokyo Koku Ki-107 so had to look it up. Does look sweet and would fit nicely into the group here. Thanks Pat. These are just the typ of the iceberg as there are many more - indeed a fascinating time of aviation. I had to do some changes on the SAI KZ II Træner cockpit after seeing the pictures here. Just didn't like how bulky the control sticks looked - much better now. I started this week on the SBS Model Goudron Caudron C.600 Aiglon. Like the SAI KZ II Træner kit, this is another great looking resin kit from SBS Models. Actually it is substantially better than the SAI KZ II Træner kit as the resin parts are much more refined and detailed. The Caudron C.600 Aiglon flew first in December 1935 and 203 aircraft had been built, mainly for private use. One military user was the Royal Hungarian Air Force which used six from 1943 to 1945 as trainers. The example I build was named Kati and looks rather attractive. Once again, construction started with the cockpit. Looks like a nice little cockpit and there was no need to scratch build anything. Next up will be the Miles Hawk Major kit. After finishing the Aiglon cockpit, the Miles M.2H Hawk Major was next. Plastic Passion has to be the silliest name for a resin kit. 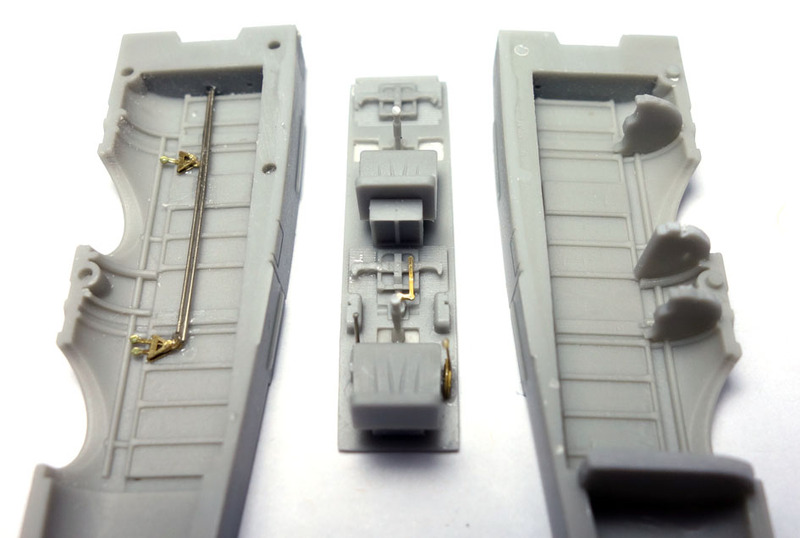 The parts are nicely cast as made by SBS Model. But unfortunately not to the same level of detail. All is a bit simpler and there is no PE included. The Miles M.2 Hawk Major's first flight was in 1934 and achieved second place in the 1934 King's Cup Race with an average speed of 147.78 mph. A hole range of subversions had been built, totaling at 64 aircraft. Originally I wanted to build DG590 in RAF markings. This aircraft still exists in this marking at at the Montrose Air Station Heritage Centre. But these markings are not WWII originals as the aircraft received it's civil registration G-ADMW after the war and was only painted in 1964 in the military colours it is today. Unfortunately I couldn't find a picture of DG590 from the war years. Instead I like to build it in a scheme a bit closer to home. This Miles M.2H Hawk Major was purchased by the Aero Club of South Australia in 1935 and spent some time after 1941 in RAAF service as A37-5. I assume the aircraft was in silver dope wit black registrations, but I have no clue what colours the stripes on the rudder are. As with the previous two builds, work started on the cockpit. After building the cockpits of the two SBS Model kits, this was rather underwhelming. And that how it looks with the "lid" on. 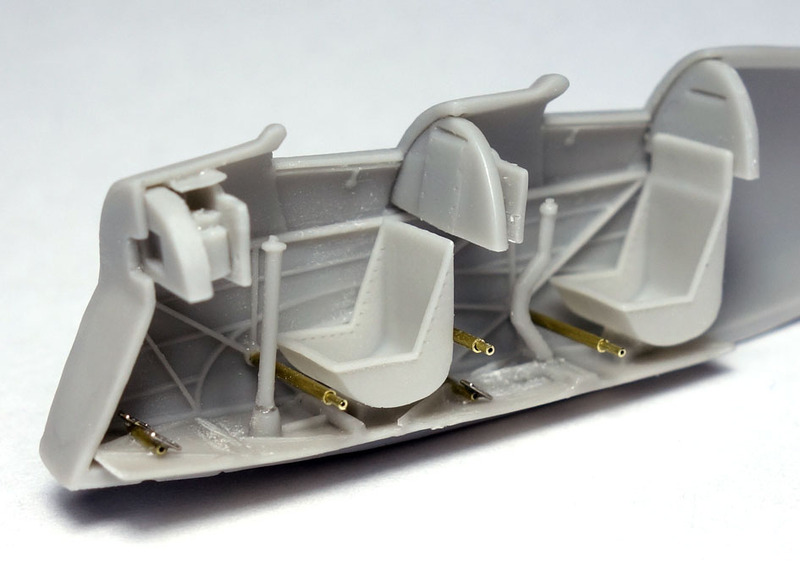 But to get the seats at the correct location as shown above the cockpit insert needed some modifications. The front needed to be shorten by 1mm and the rear seat and stick needed to be moved back by 1mm as shown above. I have to say that this kit is a bit of a disappointment as it lacks in detail at a lot of places. As only four parts needed to be glued together, I had some time left to get cracking on the Beneš-Mráz Be-250 Beta Major. This Kora kit does look like many other resin kits. But if I thought the Plastic passion kit was not up to standards, this is 100 times worth. I did assemble the parts making most of the cockpit. I had to scratch build one of the sticks as it shattered into many pieces when cleaning it up. The fuselage halves and IPs are even worth. And the instructions are the perfect companion for this kit. But the main problem is that there is no detail whatsoever on the external parts and without finding any usable information, I decided to do the most logical thing with this build - sending it to kit heaven . In my age, live is just too short dealing with this kit as I don't desperately need to build a Be-250 Beta Major. Instead I had a look in my stash to see what I could build instead. And as we talked about some other look alike, I selected the RS Model Miles M.14 Magister and AZ Model Klemm 35. Unfortunately I don't have the Fairchild PT-19, otherwise I would have put in in the mix as well. The upside is that I can build some traditional plastic kits now. As the weather was on the hot side most of this week (around 40 degrees) and still is until Monday, I didn't want to use my airbrush or CA, so it was a good opportunity to start the two plastic kits. First was the Klemm 35. I was surprised how little information I found on the web, considering what an important and widely used trainer aircraft it was. 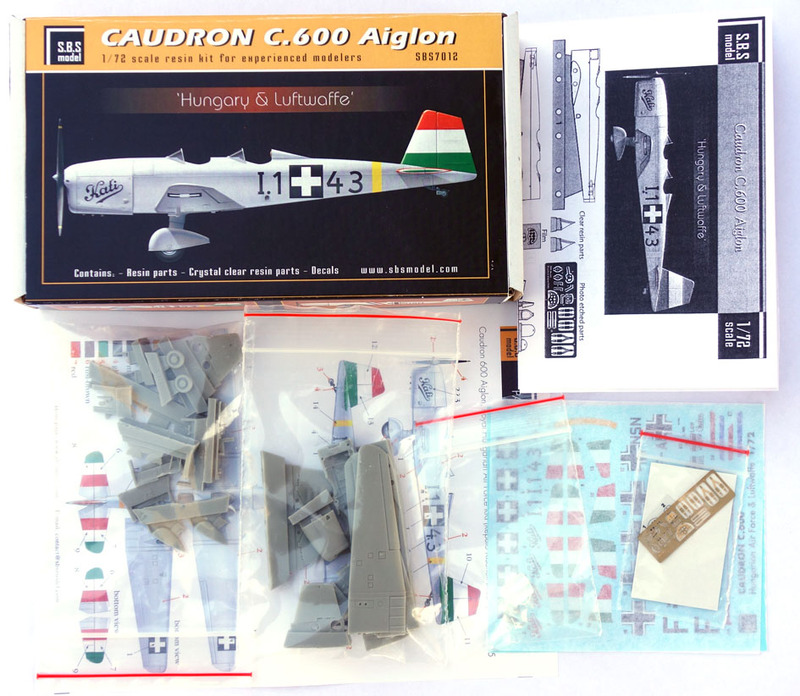 The AZ Models kit looks promising in the box. I choose the aircraft from the Lithuanian paramilitary National Guard Aviation. Three aircraft were purchased in 1939 and were used mainly for refresher training. Considering that this kit is from 2015, I have to say I expected more. Sure. the surface detail is nicer than the old Huma model, but otherwise it is rather crude. Did some work on the cockpit. The cockpit side wals needed sustantial thinning to mace them look close to scale. The rear cockpit is done in the above picture. I am not convinced that there is a floor above the main spar as in this kit as it does make the cockpit look a bit squashed. The four parts I glued into the cockpit had a terrible fit. Too large or too small. I also added a fire wall which is missing. And the seats are a choke. Second from the left is how it is in the kit (after thinning the side substantially). I saww them in half and removed a bit from the center to make the width more to scale. The seat back also needs to be extended. Still a bit more work to make them look acceptable. And then there are the wings. They are a solid one part with the trailing edge looking similar as the leading edge! The above picture has this corrected. Unfortunately this eliminated the fabric imitation on the ailerons. But not a great loss as the imitation looked terrible. And did I mention the wheels. Left is the original part. Fortunately there are separate wheels in the kit for use with an other version. They look about the correct size so I will use the to rework the spats. Lets hope the Magister kit is more fun to build. Oh yeah. This is the work I've expected. And the RS kit will be a little better I think. The RS Model offering of the Miles M.14A Magister looks like a more complete package as it includes some PE as well. I decided to do a Magister from the Irish Air Corps. They received 27 aircraft in three batches between 1939 and 1946, making it the most numerous type in Irish Air Corps service! The first delivery of 10 aircraft was during 1939 with the numbers 31 to 40. The Magisters had a black fuselage with polished engine covers and silver wings. This lot arrived camouflaged on the top with a black fuselage on the bottom half and silver wings. The remaining aircraft from the first lot also received these colours. And the final 12 made it to Ireland during 1946, mainly to replace lost airframes from the first two deliveries. They received the numbers 127 to 138. This delivery reverted back to the pre-war peace time colours, but with a black engine cover this time. Also the spats had not been fitted on these 12 aircraft. I haven't made up my mind in which scheme I will paint the model - all look attractive. This is another typical short run kit with all the hallmarks to expect. But the detail looks rather good. Started with re-scribing the cockpit hatches as they were represented with raised panel lines. Front one is done. I kept the bottom raised panel line in place as it represents nicely the hinge. The cockpit interior doesn't look too bad and the parts fitted well. I added the missing fire wall and some extra timber work. I also opened the cap behind the engine as per the original aircraft. As the wings contain the cockpit floor, getting them together was next. Like most short run kits, the wing trailing edge was rather thick and reducing them was a bit of work. But they look now so much better. Unfortunately this meant to re-scribe some lost panel lines. Now the wings are ready to build the cockpit. But it looks that the fuselage to wing joint isn't the best, so I decided to finish the upper fuselage first so that I can fit it properly to the wings without damaging any delicate cockpit parts. I have to say that this is a very enjoyable kit to build compared to the AZ Models Klemm 35. Nice progress. And I see the SEAC or Aussie version on the decals? Thanks zegeye. No, that is a Magister in Thai markings! Talking about Magister, I decided to add a bit of extra detail into the cockpit. The two compass came with the kit and the rest is based on various cockpit photos I found on the net. Should bring a bit of life into this pit when painted. Yes they are looking attractive and I will have a hard time deciding which one to paint the model in. This is a period picture. So the Klemm 35 did had a floor in the cockpit after all! and from a restored aircraft. 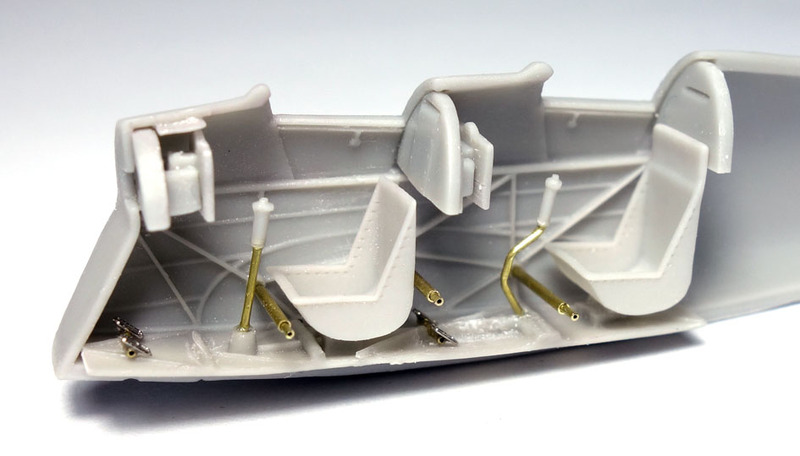 Of interest is the complex arrangement of the rudder pedals - which I didn't replicate. Not perfect but at least it doesn't look so empty any more. And yes, the seats aren't straight on the floor as the floor is on a slight angle in the fuselage. But this won't be seen when it is all together (I hope). Correcting the seats did made a big improvement. I also found the Klemm Flieger Forum which has a listing of all the remaining aircraft and some great detail pictures (but the site is in German). Of interest is that apparently all Klemm 35 still in existence are former Royal Swedish Air Force aircraft. You right, they normally show up after a major building step I guess I was lucky this time. Went through all the builds today to get them ready for painting. I made sure everything goes together so I won't have too many unpleasant surprises after. I did add some extras into the Miles Hawk Major cockpit as it looked a bit empty. So now the lot is ligned up for adding the primer coat. Here are the five look alike. The Arado 96 is from an other build here and the Dora Wings Percival Vega Gull I started a while ago. Painted cockpits this week - five of them. And this is the result. Also had to do the Instrument panels too. The PE is painted a very dark grey and the rear of the films are painted white. And ready to glue them together. I used gloss varnish to do that and also to attach them in the models. Lets have a look at cockpits in the order I started the five models. They are now painted and have a wash/filter in place. First up is the SAI KZ II cockpit. the second was the Caudron C.600 Aiglon cockpit. The completed floor. There is still some oil paint needed to finish the seats. And all the cockpit parts. Third in line was the Miles Hawk Major. Found a picture with this "Poison Green" interior colour, so I thought why not. The Harnesses still need to be painted. Having the resin stuff done, the Klemm 35 was next. used some left over film to make up the IPs. still have to finish painting the two white instruments. And last but not least, the Miles Magister pit. And the two fuselage sides. Next steps are a flat cote so that I can apply a bit of wear and tear to them. Also this lot has to be added to the seats before I can call them done.